Two-thirds of the foreign drug manufacturers subject to inspection by the Food and Drug Administration may never have been visited by agency inspectors, a government watchdog told Congress Thursday. The FDA this year listed 3,249 foreign pharmaceutical manufacturers subject to its inspection - yet the agency cannot determine whether it has ever inspected 2,133 of them, according to a Government Accountability Office report released during a House subcommittee hearing. While some of the more than 3,000 firms may never have exported prescription drugs or drug ingredients to the United States, others likely have. Who are those firms and what are they shipping? asked Rep. Bart Stupak, D-Mich., during Thursday's hearing of the House Energy and Commerce subcommittee on oversight and investigations. "We don't know and we are not certain the FDA knows," Marcia Crosse, director of health care at the GAO, replied. The few foreign inspections the FDA does conduct in any given year hit just 7 percent of the foreign drug makers exporting to the U.S., the GAO estimates. That means more than 13 years can pass before a foreign manufacturer is visited even once, Crosse said. In the case of China, which with 714 boasts the largest number of drug firms subject to FDA scrutiny, the record is far worse. The FDA is slated to inspect just 13 Chinese establishments this year, meaning just 1.8 percent will see an FDA inspector, according to the GAO report. CBS News correspondent Chip Reid reports that an estimated 200,000 to 300,000 Chinese die each year from tainted drugs. In response to questions about the Chinese drug manufacturers, former FDA official William Hubbard testified, "If they can't protect their own people, I don't think we can depend on them or any other country to protect us - we need to protect ourselves." In India, the No. 2 country in terms of FDA inspections, the record is far better. There, 65 of its 410 firms, or 15.8 percent, are slated for inspection this year, according to the GAO. That's in line with the 16.8 percent of Swiss drug firms the FDA likely will inspect in 2007. The GAO and Congress have long warned of the FDA's shortcomings in its foreign drug inspection program. The GAO findings released Thursday largely reprise many of the same warnings outlined in a 1998 report. "It's deja vu all over again," Rep. John Dingell, D-Mich., said. Nearly all U.S. drug makers are inspected at least once every two years, as mandated by a law drawn up long before imports seized a sizable chunk of the drug market. There is no such requirement that the FDA conduct foreign inspections with any regularity, even as imports of all kinds grow in volume. Concerns about the safety of imported drugs, food, toys and other consumer products have been at the fore for months. "We're finding ourselves again on the brink of one more problem dealing with imports into our country," said Rep. Michael Burgess, R-Texas, adding that current FDA laws and regulations were never intended to handle the increasing volume of imports. An estimated 80 percent of the active pharmaceutical ingredients used to make drugs sold in the U.S. are imported. 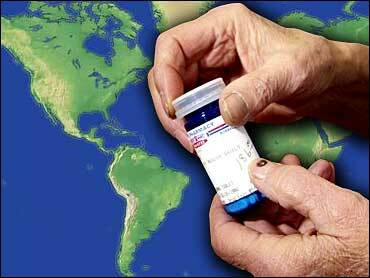 Among finished drugs, an estimated 40 percent are made abroad. The FDA plans to inspect just 300 foreign drug firms this year, announcing in advance its intent to do so each time. That can hinder the FDA's ability to view normal, day-to-day operations, the GAO found. Further, FDA inspectors aren't provided with translators, leaving them to rely on English-speaking firm employees. Of those foreign inspections, 88 percent are of firms that make drugs awaiting FDA approval, according to the GAO. The balance are of the type of periodic assessment meant to ensure a company's products remain safe in the years following FDA approval. Within the U.S., the proportion is flipped, with 78 percent of FDA drug inspections of the routine, surveillance variety. The FDA's monitoring of foreign-made drugs relies on more than just inspections, said agency commissioner Dr. Andrew von Eschenbach in his prepared testimony. FDA approvals of new drugs are manufacturer-specific and include requirements regarding how and where a medicine is made, he said. Much of the uncertainty in the FDA's handle on foreign drug makers stems from its outdated computer systems, which rely on multiple databases that contain sometimes conflicting information that can be compared only manually, the GAO found. Those databases, for instance, contain tallies of foreign drug firms subject to FDA inspection that range from roughly 3,000 to about 6,800, the GAO found. "How can we have any confidence FDA is truly managing the risk that may come from foreign-made drug products if the FDA doesn't know the exact number or location of foreign drug manufacturers," Stupak said. Von Eschenbach said the U.S. drug supply is among the world's safest. "We shouldn't leave people with the impression the drug supply is unsafe --, " said William Hubbard, the former FDA associate commissioner. "It's vulnerable," interjected Rep. Greg Walden, R-Ore., finishing his sentence.